For England Cricketer Chris Jordan, I wanted to create a space that was both masculine as well as warm and homely, as he spends large amounts of time away from home on tour with the England squad. I wanted to create a space that he would feel excited to return to, that had the same luxury as the hotels he stays at while away but with a far more personal feel. I wanted to create a space that allowed for personal expression for him and celebrates his individuality and successes but still felt welcoming for his friends and family while entertaining or staying with him. To do this I mixed cool steel greys with blacks and whites and juxtaposed these with warming copper and bronze. The penthouse allows for plenty of light, which as a designer is always a benefit and great starting point. The open plan of the kitchen and living space allows for a flow of areas in which to entertain. As a designer, once I had presented the initial design concept to Chris we set about the fun part, SHOPPING, and Chris and I worked closely together visiting some of my favourite spots for the larger items of furniture. Most of this time was spent in Flagship design stores in London, but I also wanted to bring a touch of Sussex into his home and so we also visited a number of stores from my little black book! In addition I had made the agreement with Chris that I had full control of his bedroom, and so he was actually banned from entering this room during the redesign! This was exhilarating and nerve wracking for us both! As you enter the penthouse you are flooded with natural light from the large skylight in the hall. The bedrooms fall off to the left, with the living space to the right and the kitchen in front and so this area is the connective space into each room, which each have their own personality. 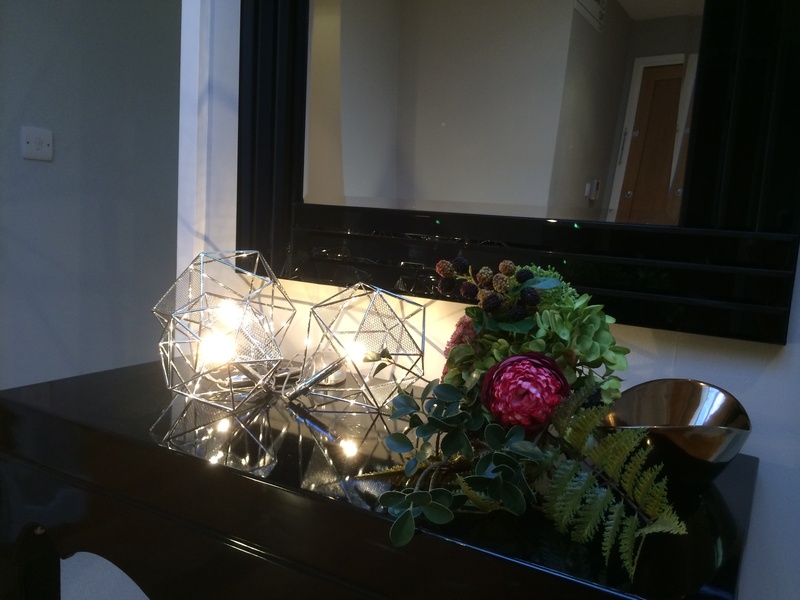 As a result I kept this large area minimalist and practical, with a simple Black gloss table upon which keys are stored as well as a large mirror above and a contemporary light. A floor lamp by Tom Dixon at Heals adds further light for evenings and its design adds an industrial feel, which is another theme we have worked with throughout the penthouse. The kitchen had already been completed prior to the purchase and so this space needed simply dressing, and so the accessories were sourced by LSA, Zara Home, Dualit and Steamer Trading Cook Shop. I dressed the breakfast bar with decorative matte black stools by Kartell, which stops the space becoming clinical. The first item we actually bought was a piece of art for the formal Dining area, a black and white photograph of a Lion in the Wild from Dwell. This sits above a Glass topped table, with matching chairs to those in the kitchen, Matte black and decorative backed by Kartell and sourced from Heals. Also upon the table sit Matte Black and copper bowls by Tom Dixon for Heals, as well as a silver Candle holder by John Lewis. Moving towards the living room space a palette of blacks, greys, copper and silver continue and are warmed by the oak wooden floors. The area is softened with rugs sourced from Germany which provide a welcome introduction to the copper accessories and table decorations. The soft pattern from the cushions, sourced from French Connection and Heals, on the light grey sofa, also French Connection, add interesting detail. Next to an armchair the Copper candle stand from Papillion has been transformed into a table stand, perfect for resting a Cognac in its LSA glass, while watching the TV or relaxing with friends. The designer wallpaper behind the television was sourced from Mister Smith Interiors in Brighton, and its dark colour and texture means that the large TV feels less imposing in the room. Throughout I wanted to keep a sense of the playful, and so the Black and silver football table in the living space is both a perfect masculine touch and a fun talking point. On the other side of the apartment the mood is far softer, and the corridor walls are made personal with 3 pieces of laser cut wall art created by myself in my design studio, which show Chris playing cricket. The effect of the raised Perspex plays with the light and shadow creating a 4D effect. Opposite a Map of the world is a reminder of all the places Chris’s career has taken him, as well as his home in Barbados. This leads into both Chris’s bedroom and the Television room. Before this however, sits the guest room, which has a contemporary take on a 1930s feel, and mixes natural wood with white furniture. The graphic wallpaper behind the bed brings a new colour of soft mustard and this is further picked up in the rugs. The television room is a cosy space in which to relax from the outside world, a den if you will, and so the mood here is far lighter and warmer. The pale brown leather low slung sofa is decorated with plump John Lewis cushions and blankets rested upon an egg chair which picks up the bronze brush strokes wallpaper by Harlequin which lines the room. 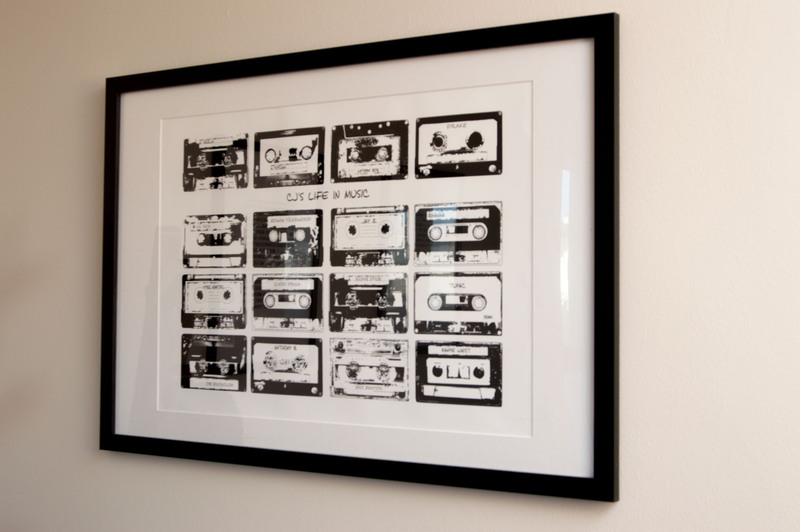 Three specially commissioned art works by Sarah & Bendrix were created, two playful references to cricket and football, Chris’ sporting passions as well as another Cassette Print, which expresses his musical tastes, including Rhianna, a childhood friend. 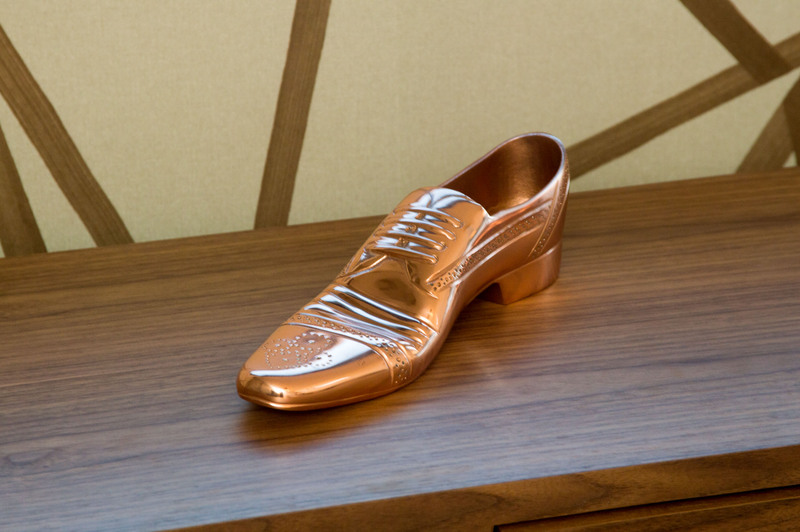 Copper ornaments by Tom Dixon at Heals sit on-top of the soft wood tables. 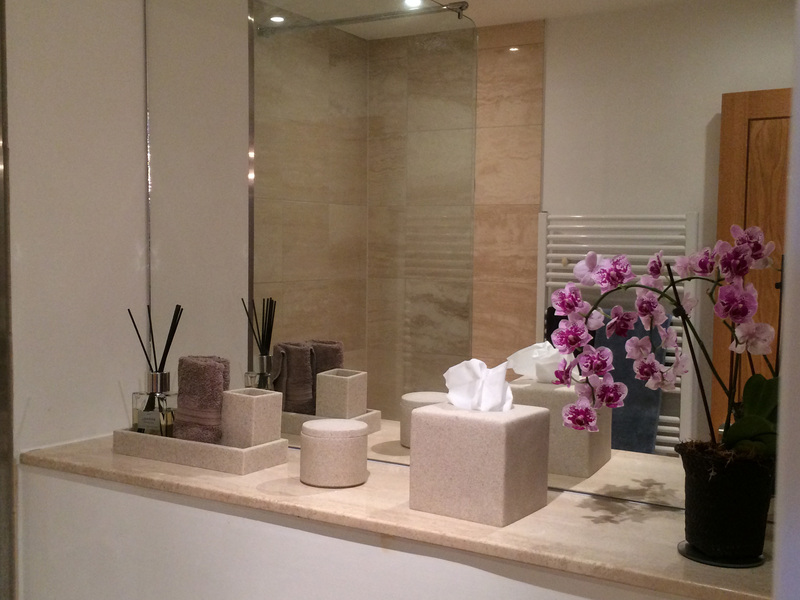 Both Bathrooms have been dressed with stone accessories from Next and the ‘London’ scent reed diffusers. Finally, into the Master bedroom and the room in which Chris had no say! I wanted to keep the space sensual while playful and also masculine, and indeed this is the most masculine of the spaces, uniting Steel grey, pewter and clear glass but it also maintains its sensuality through a mixture of textures, such as the velvet bed throw and cushions, and the thick luxurious rug sourced from Germany. Above the bed sourced from Westfield in London, sits another industrial reference the riveted mirror I sourced from Papillion in Brighton. As this room was kept under lock and key during the design completion, I sourced a Trompe l’oeil wallpaper depicting a bank vault as you enter the bedroom. 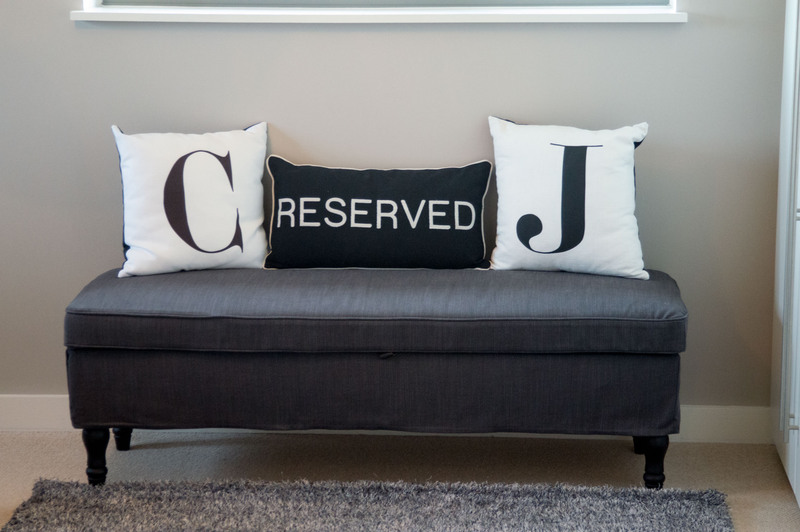 Further playful touches can be seen in the ‘Reserved’ cushion by Ben di Lisi for Debenhams and personal touches were added again in the ‘C’ & ‘J’ cushions on the chaise. This was a fun and fulfilling project which presented me with the opportunity to design a haven on earth for a very inspiring young and talented sportsman. Chris expressed his delight upon his return from the tour, and for me that was the most important factor of the project.